Whats up with all these liberal Democrats going blackface? Herring, who is second in line to the governorship behind Gov. Ralph Northam and Lt. Gov. Justin Fairfax, admitted Wednesday that he wore blackface as part of a costume he wore to a college party in 1980. 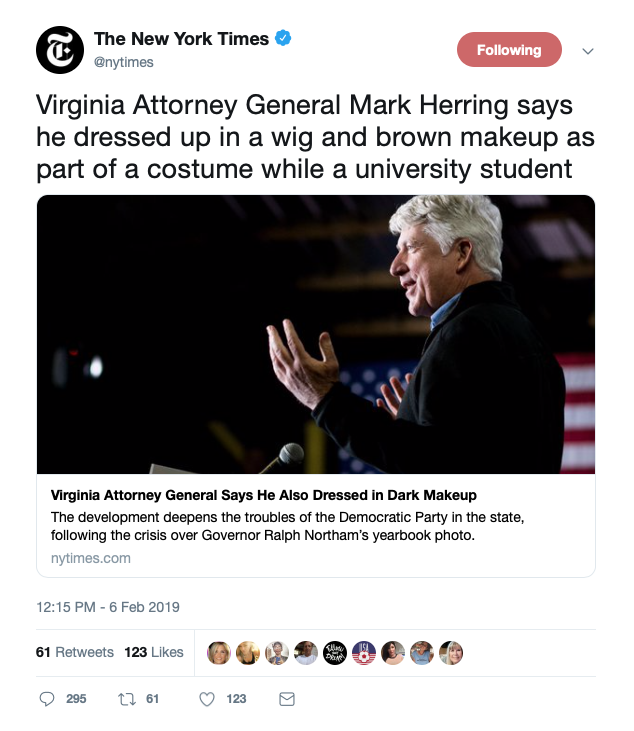 “Virginia Attorney General Mark Herring says he dressed up in a wig and brown makeup as part of a costume while a university student,” the NYT tweet said. The tweet has since been deleted and the headline updated. Heck of a headline update from The New York Times. Herring’s admission only underscored the current scandal facing Virginia Democratic leadership. Last week, a photo from Northam’s senior page in his medical school yearbook showed two young men dressed in blackface and KKK robes, although Northam denies that he is in the photo. Fairfax, meanwhile, is facing unsubstantiated accusations of sexual assault. 2 Republicans busted in Florida in the last 2 weeks for the same sin. So I guess that the Governor can just say he was just dressing as a handsome black man. The KKK outfit and "coonman" nickname might be a little harder to explain. Maybe he can self-identify as Cajun.